The surroundings seemed very surreal, foreign yet strangely familiar. It was a whole different life, a whole different marriage… When you keep visiting a place, the place grows with you. You make new memories and form new impressions. But sometimes when you, say, hear music or smell a scent you haven’t experienced in years, old memories come crashing back. You remember the feel, the atmosphere, and many of the thoughts that used to spin in your mind when you last roamed this environment, heard the song, or smelled the perfume… it’s as though you revisit an old self in a dream, but with your present self. How different the place seems when you are just a tourist. Suddenly, it’s a happy beach town packed with John Steinbeck references. We strolled along Cannery Row before heading to the beach, where our daughters encountered the ocean for the very first time. That was amazing. Brontë giggled and ran back and forth chasing seagulls, racing into the water and squealing back onto shore as the icy waves tingled her feet. Bystanders couldn’t help but chuckle at her loud, unbridled enthusiasm. How incredible everything seems to my daughter… the feel of the sand, the sounds of the ocean, the scattering sea gulls racing about the sand… it’s all so new and real and powerfully raw to children. When do we lose that enthusiasm? How do we get it back? It may be cliche, but seeing the world through your child’s eyes reminds you how stunning our universe is, even the simple things that we adults have long taken for granted. Bridget can’t walk yet, so she was sadly unable to race around the beach with her sister, but she seemed happy enough squeezing wet sand through her fingers. Kids live in the moment. The aren’t worried about what they need to accomplish, or what time it is, or what someone else will think of their behavior. They can just sit there, feeling the sun on their backs, the cool water splashing on their bare toes, and wet sand squeezing through their little fingers. We then went to the kitschy little Monterey history wax museum at Cannery Row. For a modest fee, you go underground to see a bunch of fun wax figures that appear to be unchanged since about 1955, as well as the sentiments. Many of the early exhibits show Conquistadors conquering the Natives in the Monterey area and establishing the early capitol of California (did you know Monterey used to be the capitol of California?). They depict a Spanish class of elite overlords with Native American slave labor… whipped, forcibly converted to Christianity, and otherwise treated like crap. The Spanish conquerors sure seem to have been bastards. Are we allowed to say that? Do they count as conquering Europeans in this case, or as part of Latin/Catholic history that I, as a descendent of WASP’s, should be reluctant to judge? I’m feeling white guilt confusion. Either way, the natives got a pretty raw deal. Then we learned about how sardines used to be the “in” fish to eat in America. This was the heyday of Monterey’s canning operations, the setting of John Steinbeck’s novel. I guess canned tuna hit the market eventually and America dropped sardines like bell-bottems in the 1980’s. Monterey’s canning industry never recovered. The kids couldn’t follow the history yet, of course, but they liked all the dolls dressed up in vintage costumes. 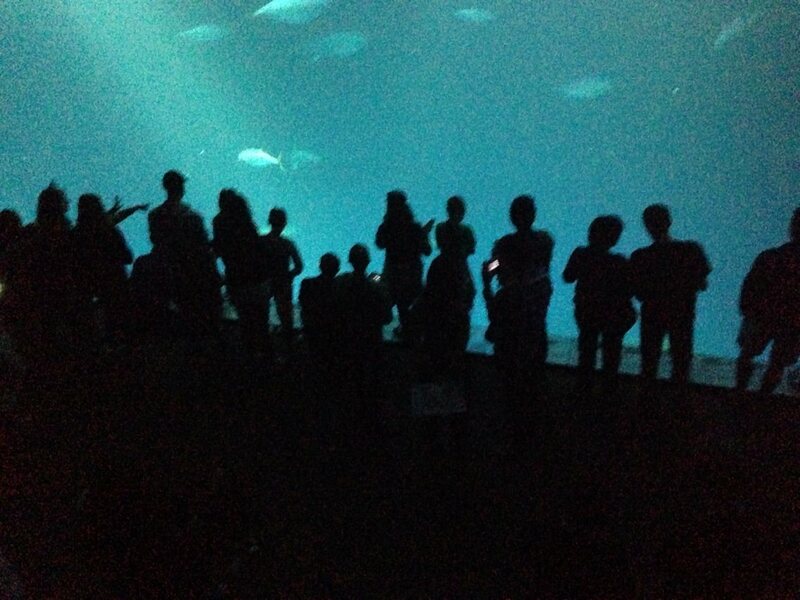 Finally, we went to the aquarium. It’s an amazing place, packed with more types of fish than I ever knew existed. The penguin tank was delightful. The hagfish was fascinating… also known as the “slime eel,” the hagfish is a primitive fish with five hearts and no eyes. They squirt a sticky sugar slime as a defense mechanism. The hag fish truly seems like it should’ve been weeded out by newer evolutionary models, but since they are still around, I guess it’s a solid design. The human animal at play, taking photos. After a long, wonderful day, we bundled the kiddos up and drive back to Sacramento. I’m a little surprised I hadn’t visited since my Army days, given that it’s only a few hours away. But then again, maybe I hadn’t wanted to revisit my Army days. 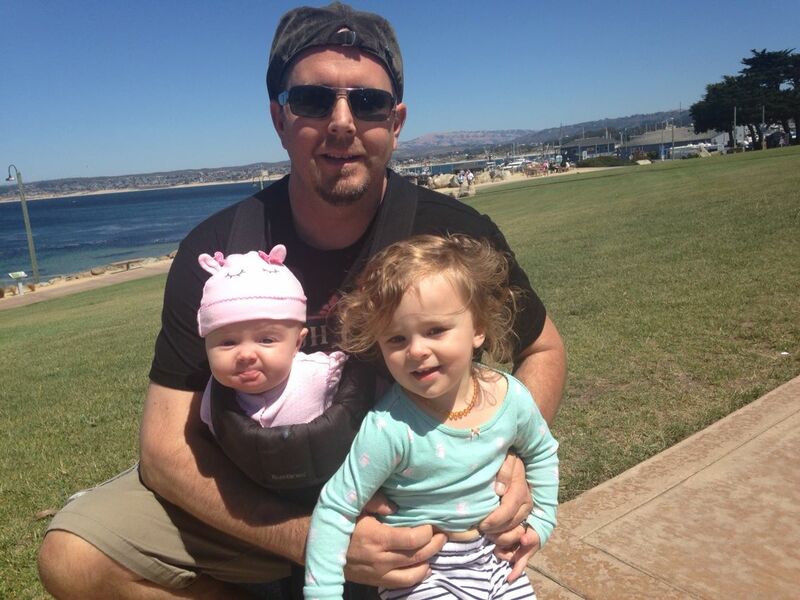 I think seeing Monterey through my children’s eyes was tremendously healing. Instead of the pressure, the fear, the uncertainty, this time I only saw the peaceful ocean, the scattering birds, and the warm sand.